Delaware, the First State of Trump Resistance! I had a personal theory on this race back in November, even before the election. We all knew that Senator Hall Long was going to win and was going to be our new Lt. Governor. Which meant that there was going to be a special election for her seat in February or March. And my theory was this: whomever lost the Presidential election was going to win the special election. So if we had a President Hillary Clinton right now, we would now be talking about a Senator John Marino. I didn’t think it would matter so much, since I didn’t think it would be for control of the State Senate, since I didn’t think Patti Blevins was going to lose to Anthony Delcollo. But I digress. But my theory has flaws. Many factors determine who wins an election and why. National events matter, and it will be the story tomorrow and going forward that this election was nationalized as the first off year election in which Democrats got a chance to voice their extreme disgust towards President Trump. The insanely high turnout for an off year Saturday February special election, and the large amount of money donated point to a Democratic electorate that was itching at the chance to vote against Trump. But, candidates do matter. And campaigns do matter. Campaign Manager Erik Raser Schramm put together an amazing staff and organization. They engaged in door to door retail campaigning throughout the large district. The campaign attracted passionate and energized volunteers. They raised enough money to dominate the airwaves, which is now a requirement in Delaware for any contested race, as the Democratic Congressional primary proved. But, that wouldn’t be possible if you don’t have a good candidate. 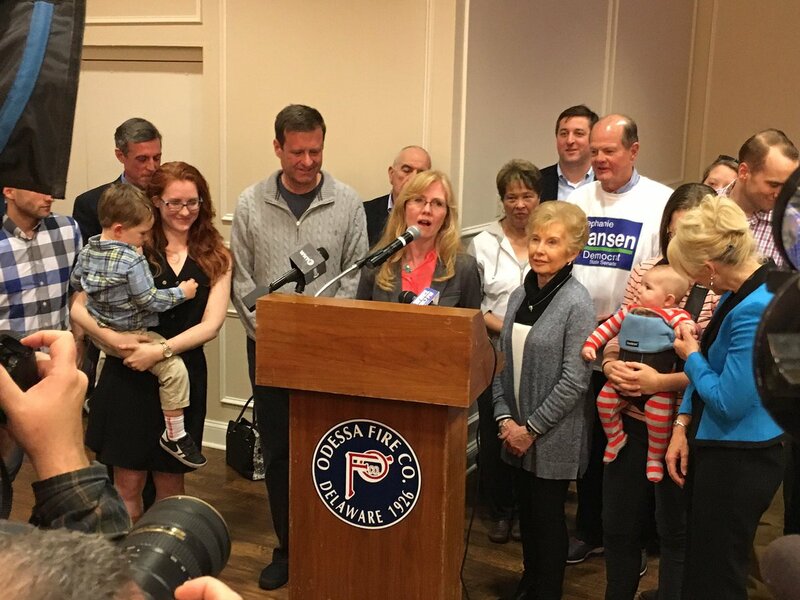 Stephanie Hansen was a spectacular candidate in this race, and she well deserves this victory. She ran a great campaign and was really impressive on the campaign trail. Yes, opposition to Trump ran up the numbers, but if you don’t have a good candidate or campaign organization to start off with, energy and enthusiasm can die off. I have seen it happen time and again. So as Vice President Biden said tonight at the Hansen victory party: Let’s turn this into a national movement! The large turn-out sends the message. People wanted to vote. They were motivated… by Trump. I do think “Delaware, the First State of Trump Resistance!” is the message. Voters I spoke to were mostly people who consider themselves “newly political”. Yup, Let’s spend more than the other person, that’s how you win elections. Anyone notice how the GOP has latched on to money as the problem in this race? I’ve seen a lot of this on FB, where Republicans are claiming to be sickened over the amount of money spent here. No acknowledgement of their own complicity in this arms race, of course. But they would NOT be complaining about money if their guy had won. Don’t get me wrong — the amount of money needed to run a campaign is obscene. But let’s not pretend that this is a long standing problem that the GOP is decidedly not interested in helping to fix. The DE GOP is so outraged that I’m anxiously awaiting a GOP sponsored bill in the GA to convert campaigns to public financing only. Just going to go over here and work on my living will, a novel, this Sudoku book, and make myself a pot of coffee to drink while I wait. And I wonderfully amused that the DE GOP Complainer in Chief is the scion of one of America’s wealthiest families… Certainly the wealthiest in Delaware… DuPont, all the Chamber of Commerce connections, richer-than-God national GOP donors like Sheldon Adelson… All that cash sitting out there and the best the DE GOP could come up with is what they ran out there with/for Marino… Why is that? Now, I’m sure the “Anono”s of the world will answer that they’re not about big business and big money to win campaigns, but the reason they couldn’t raise enough money is because the positions and brands of the GOP are, when you’re looking at a diverse district of voters or one with strong registration advantage… The positions and brands are poison and no one wants to throw suitcases of cash into a building that is already a five-alarm fire. Chickens coming home to roost, maybe?